Moo0 VoiceRecorder Download. Moo0 VoiceRecorder recorder is very simple and easy to use voice. With just one click you can start recording and the result can be saved in MP3 or WAV format. It also allows you to record sounds from any application or game running; therefore you can record audio from a radio or any kind of streaming. With the same program can play back the recording, or any other audio player. You can use the same file to record multiple sessions. The program is lightweight, does not consume resources, and has a simple window in which you must choose the file destination and a button to record, pause and stop. It offers the possibility to select between three recording options: voice only, voice and sound of PC, or PC sound only. 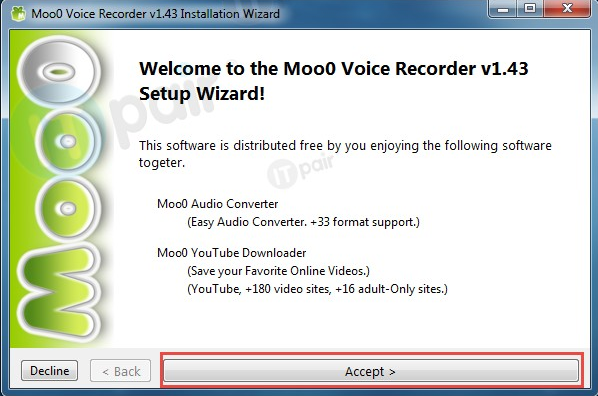 Moo0 VoiceRecorder 1.43 is the version of this application that can be downloaded free and works with all versions of Windows.